1983-1993: Dans les unités INSERM (Unité 13, Unité 21, Unité 25, Unité 200), à l’Institut de Recherche Thérapeutique. Asthme – développement d’une échelle de qualité de vie; les essais pragmatiques; Perception de la sévérité de l’asthme par les patients et les médecins. L’inflammation nasale et bronchique. – Participation à environ 40 projets d’évaluation et 10 essais de Phase II de médicaments en pneumologie. Hormone thymique et asthme. Paf-acéther et asthme. Oedème pulmonaire hyperoxique. Stratégie de coping des patients traités par pression positive continue. Participation au développement d’une orthèse d’avancée mandibulaire pour les patients atteints de syndrome d’apnées obstructives du sommeil. 1984-1992 : Diplôme d’étude spéciale – Pneumologie, Pharmacologie respiratoire et cardiovasculaire, Pharmacologie clinique et thérapeutique, Université de Paris 6. 1990-1992 : Diplôme d’étude approfondie – Pharmacologie clinique et expérimentale, Université de Paris 6. 1993 : Habilitation à Diriger la Recherche. Obstructive Sleep Apnea in Adults: Relationship with Cardiovascular and Metabolic Disorders. Édition Karger, Bâle, Suisse. Lurie A. Obstructive Sleep Apnea in Adults: Epidemiology, Clinical Presentation, and Treatment Options. In Lurie A (ed. ): Obstructive sleep apnea Relationship with cardiovascular and metabolic disorders. Basel, Karger, 2011, pp. 3-41. Lurie A. Inflammation, Oxidative Stress, and Procoagulant and Thrombotic Activity in Adults with Obstructive Sleep Apnea. In Lurie A (ed. ): Obstructive sleep apnea Relationship with cardiovascular and metabolic disorders. Basel, Karger, 2011, pp. 45-66. 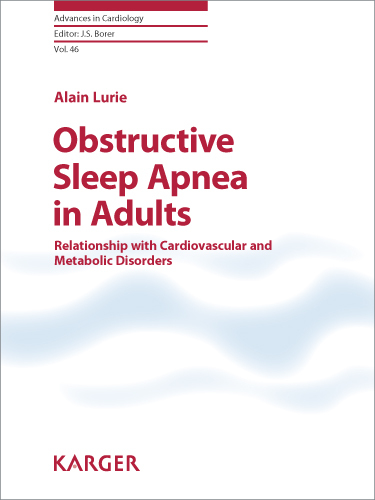 Lurie A. Metabolic Disorders Associated with Obstructive Sleep Apnea in Adults. In Lurie A (ed. ): Obstructive sleep apnea Relationship with cardiovascular and metabolic disorders. Basel, Karger, 2011, pp. 69-137. Lurie A. Endothelial Dysfunction in Adults with Obstructive Sleep Apnea. In Lurie A (ed. ): Obstructive sleep apnea Relationship with cardiovascular and metabolic disorders. Basel, Karger, 2011, pp. 141-69. Lurie A. Hemodynamic and Autonomic Changes in Adults with Obstructive Sleep Apnea. In Lurie A (ed. ): Obstructive sleep apnea Relationship with cardiovascular and metabolic disorders. Basel, Karger, 2011, pp. 173-95. Lurie A. Cardiovascular disorders associated with obstructive sleep apnea. In Lurie A (ed. ): Obstructive sleep apnea Relationship with cardiovascular and metabolic disorders. Basel, Karger, 2011, pp. 199-265. Letrait M, Lurie A, Bean K, Mesbah M, Venot A, Strauch G, Grandordy BM, Chwalow J. The Asthma Impact Record (AIR) index: a rating scale to evaluate the quality of life of asthmatic patients in France. Eur Respir J 1996; 9:1167-1173. Roche N, Lurie A, Authier S, Dusser DJ. Nasal response to capsaicin in patients with allergic rhinitis and in healthy volunteers: effect of colchicine. Am J Respir Crit Care Med 1995; 151:1151-1158. Lurie A, Nadel JA, Roisman G, Siney H, Dusser DJ. Role of neutral endopeptidase and kininase II on substance P-induced increase in nasal obstruction in patients with allergic rhinitis. Am J Respir Crit Care Med 1994; 149:113-117. Lurie A, Vivet P, Letrait M, Venot A, de Lauture D, Lockhart A, Marsac J, Strauch G. Best mode of expression of acute reversibility of airway obstruction in patients with asthma: application to a new beta-2 agonist, RU 42 173. Methods Find Exp Clin Pharmacol 1992; 14:29-33. Lurie A, Saudubray F, Eychenne JL, Venot A, de Lauture D, Dessanges JF, Lockhart A, Strauch G. Azelastine reduces allergen-induced nasal response: a clinical and rhinomanometric assessment. Eur J Clin Pharmacol 1992; 42:213-216. Chwalow AJ, Lurie A, Bean K, Parent du Chatelet I, Venot A, Dusser D, Douot Y, Strauch G. A French version of the Sickness Impact Profile (SIP): stages in the cross cultural validation of a generic quality of life scale. Fundam Clin Pharmacol 1992; 6:319-326. Lurie A, Mestiri M, Huchon G, Marsac J, Lockhart A, Strauch G, Bergogne-Berezin E, Bignon J, Carbon C, Chwalow J. Methods for clinical assessment of expectorants: a critical review. Int J Clin Pharmacol Res 1992; 12:47-52. Mestiri M, Lurie A, Frossard N, Lockhart A, Marsac J, Strauch G, Dessanges JF. Effect of inhaled morphine on the bronchial response to isocapnic hyperventilation in patients with allergic asthma. Eur J Clin Pharmacol 1991; 41:621. Lurie A, de Lauture D, Sancho-Garnier H, Marsac J, Lockhart A, Strauch G, Schwartz D. Towards pragmatic trials in asthma? Eur Respir Rev 1991; 1:57-61. Lurie A, Bernaudin JF, Theven D, Brun Pascaud M, Azoulay-Dupuis E, Soler P, Pocidalo JJ. Delayed lymphoid lung infiltration induced by cyclophosphamide in rats. Methods Find Exp Clin Pharmacol 1991; 13:405-411. Lurie A, Vlastos FD, Dusser DJ, Strauch G, Marsac J. Long-term management of reversible obstructive airways disease in adults. Lung 1990; 168:154-167. Lurie A, Chaussain M, Raynaud F, de Montis G, Strauch G, Lockhart A, Marsac J, Dardenne J. Serum thymic hormone thymulin activity is normal in children with asthma. J Allergy Clin Immunol 1989; 84:386-390. Lurie A, Theven D, Brun Pascaud M, Pocidalo JJ. Acute hyperoxic lung edema is not reduced by granulocyte depletion in rats. Respiration 1988; 53:232-238. Lurie A, Dessanges JF, Delautier D, Coeffier E, Chignard M, Cremer GA, Benveniste J, Marsac, J, Lockhart, A. Exercise- and allergen-induced asthma do not change the production of Paf-acether by neutrophils and platelets. Bull Eur Physiopathol Respir (Clin Respir Physiol) (actuellement Eur Respir J) 1987; 23:347-351. Lurie A, Pascal O, Castillon du Perron M, Grandordy B, Huchon G, Chrétien J. Pharmacologie du transport mucociliaire. Rev Mal Resp 1985; 2:117-126. Lockhart A, Regnard J, Dessanges JF, Florentin D, Lurie A. Exercise- and hyperventilation- induced asthma. Bull Eur Physiopathol Respir (Clin Respir Physiol) (actuellement Eur Respir J), 1985; 21:399-409. Cardiovascular and metabolic disorders associated with obstructive sleep apnoea in adults. Editor: Lurie A. In: Advances in cardiology. Karger, Basel, 2011, 46, pp272. Methods of assessment of anti-asthma drugs. Editeurs: Lurie A, Berglund E. Eur Respir Rev 1991; 1:1-61. Guillaume B, Forner Y, Lurie A. Coping strategies of patients with obstructive sleep apnoea [in French]. Presented to the French Sleep Research Society, Strasbourg, 2002. Pinquier JL, Lurie A, Impens N, Schandevyl W, de Lauture D, Strauch G. Effect of the paf antagonist MK287 in moderate asthmatic patients. Fund Clin Pharmacol 1993; 7:A204. Roche N, Lurie A, Dusser DJ. Nasal response to capsaicin in patients with allergic rhinitis and in healthy subjects: effect of colchicine. Am J Respir Crit Care Med 1993; 147:A710. Huchon G, Bernard JP, Bourcereau J, Brambilla C, Fournier M, Guérin JC, Lurie A, Muir JF, Nouvet G, Perrin Fayolle M, Polu MM, Taytard A, Weitzenblum E. The effects of a long-term treatment with inhaled ipratropium bromide (IP) in patients with chronic obstructive lung disease (COLD): a one-year placebo controlled multicentre study. Eur Respir J 1992; 5:A488. Lurie A, Nadel JA, Siney H, Dusser DJ. Effects of neutral endopeptidase and angiotensin converting enzyme inhibitors on nasal response to exogenous substance P in normal subjects and in patients with allergic rhinitis. Am Rev Respir Dis 1992; 145:A43. Lurie A, Chwalow J, Bean K, Parent du Chatelet I, Venot A, Douot Y, Strauch G. Cross-cultural validation of a quality of life scale for drug studies. Clin Pharmacol Ther 1992; 51:A127. Lurie A, Meulien D, Arnoux B, Acker M, Kahan A, Le Bihan C, Lockhart A, Strauch G. Endotoxin nasal challenge: a new model to study inflammation in man. Clin Pharmacol Ther 1992; 51:A127. Lurie A, Saudubray F, Eychenne JL, de Lauture D, Dessanges JF, Marsac J, Strauch G. Azelastine reduces allergen-induced nasal hyperresponsiveness in patients with allergic rhinitis: a rhinomanometric and clinical assessment. AmRev Respir Dis 1990; 141:A117. Lurie A, Bompart F, Vivet P, de Lauture D, Darchy L, Venot A, Marsac J, Strauch G. Bronchodilating activity and tolerance of RU 42 173 in asthmatic patients. Eur J Clin Pharmacol 1989; 36:A281. Also presented at the World conference on clinical pharmacology and therapeutics (IUPHAR), Heidelberg, Germany. Mestiri M, Lurie A, Frossard N, Strauch G, Lockhart A, Marsac J, Dessanges JF. Effect of inhaled morphine on isocapnic hyperventilation-induced asthma. Am Rev Respir Dis 1989; 139:A510. Lurie A, Bompart F, Mitchell M, Letrait M, Weber S, Marsac J, Venot A, Strauch G. Influence of food on pharmacokinetics of tibenelast (LY 186655), a phospho-diesterase inhibitor bronchodilator. Am Rev Respir Dis 1989; 139:A66. Lurie A, Vlastos F, Devillier P, de Lauture D, Lockhart A, Marsac J, Dessanges JF. Correlation between objective and subjective assessment of allergen-induced nasal obstruction. Am Rev Respir Dis 1988; 137:A511. Lurie A, Chaussain M, Lockhart A, Marsac J, Raynaud F, de Montis G, Bach JF, Dardenne M. Thymic hormone (FTS-Zn) in blood is normal in asthmatic children. Am Rev Respir Dis 1987; 135:A390. Lurie A, Dessanges JF, Delautier D, Marsac J, Lockhart A, Benveniste J, Cremer GA, Laroche C. Exercise- and allergen-induced asthma does not change the capacity of circulating neutrophils and platelets to release paf-acether (platelet activating factor). Am Rev Respir Dis 1986; 133:A316. Lurie A, Dessanges JF, Delautier D, Marsac J, Lockhart A, Benveniste J, Cremer GA, Laroche C. Exercise-induced asthma does not change the capacity of circulating neutrophils and platelets to release paf-acether (platelet activating factor). Clin Sci 1985; 70:A69. Lurie A, Theven D, Brun-Pascaud M, Bureau M, Pocidalo JJ. Polymorphonuclear leukocyte depletion does not prevent oxygen-induced pulmonary edema in rats. Am Rev Respir Dis 1984; 129:A4. Lurie A, Theven D, Brun-Pascaud M, Pocidalo JJ. Toxicité pulmonaire des antimitotiques – rôle de l’équilibre leucocytaire. Pneumopathies aiguës sévères de l’adulte, Editeurs : J.J. Pocidalo et F. Vachon, Arnette, Paris; 1983. p. 75-90. Atkhen P, Elouaer L, Lurie A, Dyen S. Corps étrangers intra-gastriques. Gastroenterologie, Editeurs: J.J. Bernier, Flammarion, Paris; 1984. p. 192-194. Meyniard O, Lurie A, Sicard D. Sémiologie clinique respiratoire. Séméiologie Clinique, Editeur D. Sicard, Masson, Paris et Montréal; 1989. Lurie A, Mestiri M, Slosman D, Strauch G, Marsac J. Pharmacologie du trasport mucociliaire. Pharmacologie cardiovasculaire et respiratoire, Editeurs : C. Advenier, P. Meyer, Herman, Paris; 1992. Lurie A, Mestiri M, Strauch G, Marsac J. Drugs acting on mucociliary transport. International textbook of clinical pharmacology, Editor T. Godfraind, Springer-Verlag, Berlin; 1992. Lurie A. La Qualité de vie – un nouveau critère d’évaluation de l’asthme. La Lettre du Pharmacologue 1993; 7:29-31. Lurie A, Matran R, Vlastos FD, Lockhart A, Strauch G. Les nouveaux traitements de l’asthme. Med Hyg (Suisse) 1990; 48:1196-1200. Lurie A, Vlastos FD, Strauch G, Marsac J. Perspectives thérapeutiques dans l’asthme. Entretiens de Tenon 1990; 65-67. Lurie A, Islasse M, Vlastos FD, Strauch G, Marsac J. Méthodes d’évaluation des anti-tussifs. Séminaire Spirale 1989; 18-22. Vlastos F, Lurie A, Marsac J. Interactions pharmacoconétiques entre macrolides et théophyllines. Rev Med Int 1989; 10:73-77. Lurie A. Un protocole à la loupe. Pneumographies 1988; 3:2-3. Lurie A. En quoi un hôpital de jour peut aider les asthmatiques ? Entretiens de Bichat 1988; 118-119. Ghedira H, Lurie A. Choix de l’antibiothérapie pour les infections bronchiques et pulmonaires communautaires. J Med Prat 1988; 14:10-12. Lurie A, Petitet A, Delporte N, Marsac J. Utilité pratique du dosage de la Théophylline dans le sang des asthmatiques. La lettre du pharmacologue 1988; 2:266-268. Lurie A. Les expectorants et les mucolytiques sont-ils utiles? La Lettre Médicale 1986; 97:1-4. Lurie A. Les bronchectasies. Respirer 1986, 60:11. Lurie A, Cremer GA, Laroche C. Que rechercher devant une hypouricémie. Gaz Me 1985; 92:81-82.